Geography : The Kingdom of Thailand, covering an area of 514,000 square kilometres, lies in the heart of Southeast Asia, roughly equidistant between India and China. It shares borders with Myanmar to the west and north, Lao P.D.R. to the north and northeast, Cambodia to the east and Malaysia to the south. Topography : Thailand is divided into four distinct areas : the mountainous North, the fertile Central Plains, the semi-arid plateau of the Northeast, and the peninsula South, distinguished by its many beautiful tropical beaches and offshore islands. Climate : Thailand lies within the humid tropics and remains hot throughout the year. Average temperatures are about 29oC, ranging in Bangkok from 35oC in April to 17oC in December. There are three seasons: the cool season (November to February), the hot season (April to May), and the rainy season (June to October), though downpours rarely last more than a couple of hours. Population : Thailand has a population of about 60 million. Ethnic Thais form the majority, though the area has historically been a migratory crossroads, and thus strains of Mon, Khmer, Burmese, Lao, Malay, Indian and most strongly, Chinese stock produce a degree of ethnic diversity. Integration is such, however, that culturally and socially there is enormous unity. What To Wear : Light, loose cotton clothing is best. Nylon should be avoided. Sweaters are needed during the cool season evenings or if visiting mountainous areas or national parks. Jackets and ties are required in a few restaurants and nightclubs. Neat clothes are required for entering temples or palaces. Local Time : GMT + 7 hours. Business Hours : Most offices open from 9 am to 5 pm, Monday to Friday, except on public holidays. General banking hours are Monday to Friday 9.30 am to 3.30 pm. Many stores open 12 hours a day, seven days a week. Currency : There are 100 satangs in 1 baht. (B=baht) Notes are issued in denominations of B1000 (gray), B500 (purple), B100 (red), B50 (blue), B20 (green), and B10 (brown). There are 10, 5 and 1 baht coin, and 50 and 25 satang. Most foreign currencies and traveller cheques are easily changed at banks, hotels or moneychangers. All major credit cards are widely accepted throughout the kingdom. (50 cycles). There are many plugs and sockets in use. Travelers with shavers, tape recorders and other appliances should carry a plug-adapter kit. The Thai people founded their kingdom in the southern part of China, which is Yunnan, Kwangsi and Canton today. A great number of people migrated south as far as the Chao Phraya Basin and settled down over the Central Plain under the sovereignty of the Khmer Empire, whose culture they probably accepted. The Thai people founded their independent state of Sukhothai around 1238 A.D., which marks the beginning of the Sukhothai Period. Thais began to emerge as a dominant force in the region in the13th century, gradually asserting independence from existing Khmer and Mon kingdoms. Called by its rulers "the dawn of happiness", this is often considered the golden era of Thai history, an ideal Thai state in a land of plenty governed by paternal and benevolent kings, the most famous of whom was King Ramkamhaeng the Great. However in 1350, the mightier state of Ayutthaya exerted its influence over Sukhothai. The Ayutthaya kings adopted Khmer cultural influences from the very beginning. No longer the paternal and accessible rulers that the kings of Sukhothai had been, Ayutthaya's sovereigns were absolute monarchs and assumed the title devaraja (god-king). The early part of this period saw Ayutthaya extend its sovereignty over neighboring Thai principalities and come into conflict with its neighbours, During the 17th century, Siam started diplomatic and commercial relations with western countries. In 1767, a Burmese invasion succeeded in capturing Ayutthaya. Despite their overwhelming victory, the Burmese did not retain control of Siam for long. A young general named Phya Taksin and his followers broke through the Burmese encirclement and escaped to Chantaburi. Seven months after the fall of Ayutthaya, he and his forces sailed back to the capital and expelled the Burmese occupation garrison. The rule of Taksin was not an easy one. The lack of central authority since the fall of Ayutthaya led to the rapid disintegration of the kingdom, and Taksin's reign was spent reuniting the provinces. After Taksin's death, General Chakri became the first king of the Chakri Dynasty, Rama I, ruling from 1782 to 1809. His first action as king was to transfer the royal capital across the river from Thon Buri to Bangkok and build the Grand Palace. Rama II (1809-1824) continued the restoration begun by his predecessor. King Nang Klao, Rama III (1824-1851) reopened relations with Western nations and developed trade with China. King Mongkut, Rama IV, (1851-1868) of "The King and I" concluded treaties with European countries, avoided colonialization and established modern Thailand. He made many social and economic reforms during his reign . King Chulalongkorn, Rama V (1869-1910) continued his father's tradition of reform, abolishing slavery and improving the public welfare and administrative system. Compulsory education and other educational reforms were introduced by King Vajiravudh, Rama VI (1910-1925). During the reign of King Prajadhipok, (1925-1935), Thailand changed from an absolute monarchy to a constitutional monarchy. The king abdicated in 1933 and was succeeded by his nephew, King Ananda Mahidol (1935-1946). The country's name was changed from Siam to Thailand with the advent of a democratic government in 1939. Our present monarch, King Bhumibol Adulyadej, is King Rama IX of the Chakri Dynasty. Thailand is one of the most strongly Buddhist countries in the world. The national religion is Theravada Buddhism, a branch of Hinayana Buddhism, practiced by more than 90 % of all Thais. The remainder of the population adheres to lslam, Christianity, Hinduism and other faiths - all of which are allowed full freedom of expression. Buddhism continues to cast strong influence on daily life. Senior monks are highly revered. Thus, in towns and villages, the temple (wat) is the heart of social and religious life. Meditation, one of the most popular aspects of Buddhism, is practiced regularly by numerous Thai as a means of promoting inner peace and happiness. Visitors, too, can learn the fundamentals of this practice at several centres in Bangkok and elsewhere in the country. 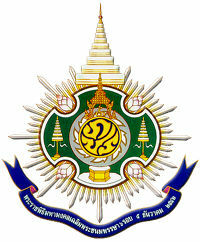 His Majesty the King's initials the Thai letters Phor Por Ror placed at the centre of the crest, under the Royal Crown and above the Royal Throne of the Eight Compass Points, signify that His Majesty is the focus of the entire nation, binding the people's hearts and loyalty. The yellow colour of the letters is the colour of His Majesty's day of birth, and the blue colour of the background that of the monarchy. The surrounding discus (Chakra) with the Thai numeral 9 means that King Bhumibol Adulyadej is the ninth monarch of the Chakri Dynasty. The crest is flanked by two seven-tiered umbrellas and topped by a nine-tiered umbrella, both types symbols of kingship. The four-point border represents the four regions of the country, in which the people live in peace and tranquillity under the King's supreme protection, as expressed by the green colour, which is a symbol of peace and abundance. Each of the four points of the border has a lotus flower, an offering to His Majesty on the occasion of his sixth-cycle birthday anniversary. The golden rays around the crest signify His Majesty's grace and benevolence, which pervade the Kingdom and beyond, and bring pride and joy to the people throughout the entire land. Beneath the crest, a blue silk banner bears the inscription of the Celebration on the Auspicious Occasion of His Majesty's 6th-Cycle Birthday Anniversary on 5 December 1999.